Graphic representation of the intracorneal ring segments in place. Reprinted with permission of Addition Technology Inc.
Intacs microthin prescription inserts treat mild myopia. Reprinted with permission of Addition Technology Inc.
KeraVision Intacs microthin prescription inserts. Reprinted with permission of Addition Technology Inc.
KeraVision Intacs microthin prescription inserts. Intracorneal ring segments. Reprinted with permission of Addition Technology Inc.
MediPhacos KeraRing is another intracorneal ring segment developed and marketed in Brazil. It is available in 2 models for 5-mm implantation in optical zones of 5 mm, 5.5 mm, and 6 mm. There are 40 different variations of thicknesses, arc lengths, and diameters, allowing for enhanced customization of corneal remodeling and refractive correction. Over 150,000 implants have been used worldwide. Ferrara Ring is made of yellow PMMA, an inert and biocompatible acrylic used in intracorneal implants. The apical diameters are 5 mm and 6 mm. It has a flat base with a variable arch length of 90 mm and 210 mm and a variable thickness of 0.15 mm to 0.30 mm. How do intracorneal ring segment inserts work? 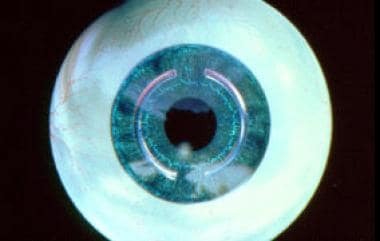 Intracorneal ring segments may now be used to treat irregular steepening (irregular astigmatism) of the cornea caused by keratoconus. [27, 28] There is a stabilization or delay of cone progression. The intracorneal ring segment is made of acrylic, an inert and biocompatible material; therefore, there is lack of rejection. There is a high patient satisfaction rate. It is possible to combine with other procedures like contact lens fitting, corneal collagen cross-linking, PRK, phakic IOL implantation, and intraocular lenses. There is no evidence of any interference with a corneal transplant. Addition Technology (Intacs) is the popular intracorneal ring segment used in Australia and the United States. 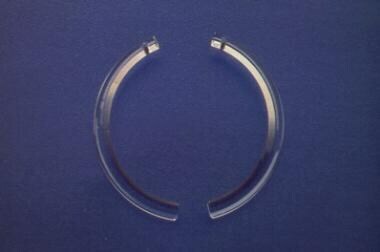 In Europe, Ferrara Ring intracorneal ring segments are popular. Addition Technology was recently acquired by Ferrara Ring. 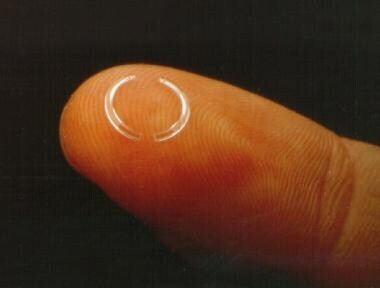 Ferrara Ring has been in development since 1986 and over 100,000 implants have been used with excellent results. According to the FDA, Intacs are intended for the reduction or elimination of mild myopia (-1.00 to -3.00 D spherical equivalent at the spectacle plane) in patients who are aged 21 years or older, in patients with documented stability of refraction as demonstrated by a change of less than or equal to 0.50 D for at least 12 months prior to the preoperative examination, and in patients where the astigmatic component is +1.00 D or less. The main indication for the Ferrara Ring implant is for the management of progressive keratoconus (ie, with gradual decrease of uncorrected visual acuity [UCVA] and best-corrected visual acuity [BCVA] and progressive corneal steepening). The Ferrara Ring implant is also indicated in patients with unsatisfactory BCVA with glasses and intolerance to contact lenses and in post-LASIK corneal ectasia when there is worsening of the condition. Increased intraocular pressure results from the use of the vacuum-centering guide. The surgeon should limit continuous application of the vacuum to 3 minutes or less and to no more than 750 mBar. In some instances, reapplication of the vacuum may be necessary, and it is advised that a 5-minute "reperfusion" phase be allowed prior to reestablishing suction. It is not advisable to use intracorneal ring segments in patients with systemic diseases likely to affect wound healing (eg, insulin-dependent diabetes, severe atopic disease). It is not advisable to use intracorneal ring segments in patients with a history of ocular manifestations of herpes simplex virus or herpes zoster virus. Resterilization and/or reuse of intracorneal ring segments are not recommended. The use of thicker diameter (0.35 mm) ring segments is accompanied by a higher probability for a reduced outcome compared to the use of the thinner diameter (0.25-0.30 mm) ring segments. Dissatisfaction from the reduced outcomes may lead to a higher rate of removal of thicker diameter (0.35 mm) ring segments. Patients with myopia of -1.00 D carry the higher risk for overcorrection. Lovisolo CF, Fleming JF. Intracorneal ring segments for iatrogenic keratectasia after laser in situ keratomileusis or photorefractive keratectomy. J Refract Surg. 2002 Sep-Oct. 18(5):535-41. [Medline]. Gomez L, Chayet A. Laser in situ keratomileusis results after intrastromal corneal ring segments (Intacs). Ophthalmology. 2001 Oct. 108(10):1738-43. [Medline]. Guell JL, Velasco F, Sanchez SI, et al. Intracorneal ring segments after laser in situ keratomileusis. J Refract Surg. 2004 Jul-Aug. 20(4):349-55. [Medline]. Cochener B, Le Floch-Savary G, Colin J. [Excimer photorefractive keratectomy (PRK) versus intrastromal corneal ring segments (ICRS) for correction of low myopia]. J Fr Ophtalmol. 2000 Sep. 23(7):663-78. [Medline]. Davis EA, Hardten DR, Lindstrom RL. Laser in situ keratomileusis after intracorneal rings. Report of 5 cases. J Cataract Refract Surg. 2000 Dec. 26(12):1733-41. [Medline]. Barbara A, Shehadeh-Masha'our R, Garzozi HJ. Intacs after laser in situ keratomileusis and photorefractive keratectomy. J Cataract Refract Surg. 2004 Sep. 30(9):1892-5. [Medline]. Colin J, Velou S. Utilization of refractive surgery technology in keratoconus and corneal transplants. Curr Opin Ophthalmol. 2002 Aug. 13(4):230-4. [Medline]. Guell JL. Are intracorneal rings still useful in refractive surgery?. Curr Opin Ophthalmol. 2005 Aug. 16(4):260-5. [Medline]. Chan SM, Khan HN. Reversibility and exchangeability of intrastromal corneal ring segments. J Cataract Refract Surg. 2002 Apr. 28(4):676-81. [Medline]. Asbell PA, Ucakhan OO, Durrie DS, et al. Adjustability of refractive effect for corneal ring segments. J Refract Surg. 1999 Nov-Dec. 15(6):627-31. [Medline]. Colin J, Cochener B, Savary G, et al. Correcting keratoconus with intracorneal rings. J Cataract Refract Surg. 2000 Aug. 26(8):1117-22. [Medline]. Colin J, Cochener B, Savary G, et al. INTACS inserts for treating keratoconus: one-year results. Ophthalmology. 2001 Aug. 108(8):1409-14. [Medline]. Alio J, Salem T, Artola A, et al. Intracorneal rings to correct corneal ectasia after laser in situ keratomileusis. J Cataract Refract Surg. 2002 Sep. 28(9):1568-74. [Medline]. Ertan A, Colin J. Intracorneal rings for keratoconus and keratectasia. J Cataract Refract Surg. 2007 Jul. 33(7):1303-14. [Medline]. Ameerh MA, Hamad GI, Ababneh OH, Gharaibeh AM, Refai RM, Bdour MD. Ferrara ring segments implantation for treating keratoconus. Int J Ophthalmol. 2012. 5(5):586-90. [Medline]. [Full Text]. McDonald JE, Deitz DJ. Removal of Intacs with a fractured positioning hole. J Refract Surg. 2004 Mar-Apr. 20(2):182-3. [Medline]. Fleming JF, Wan WL, Schanzlin DJ. The theory of corneal curvature change with the Intrastromal Corneal Ring. CLAO J. 1989 Apr-Jun. 15(2):146-50. [Medline]. Sugar A. Correction of spherical myopia with a single 150-degree intrastromal corneal ring segment. J Cataract Refract Surg. 2004 May. 30(5):1127-9. [Medline]. Burris TE, Ayer CT, Evensen DA, et al. Effects of intrastromal corneal ring size and thickness on corneal flattening in human eyes. Refract Corneal Surg. 1991 Jan-Feb. 7(1):46-50. [Medline]. Ito M, Arai H, Fukumoto T, et al. INTACS before or after laser in situ keratomileusis: correction of thin corneas with moderately high myopia. J Refract Surg. 2004 Nov-Dec. 20(6):818-22. [Medline]. Linebarger EJ, Song D, Ruckhofer J, et al. Intacs: the intrastromal corneal ring. Int Ophthalmol Clin. 2000 Summer. 40(3):199-208. [Medline]. Rosen E, Kowalewski E. Instrument for initiating the corneal intrastromal channel for the insertion of Intacs. J Cataract Refract Surg. 2001 Sep. 27(9):1356-8. [Medline]. Ferrara Ring surgical kit. Ferrara Ring. Available at http://www.ferrararing.com.br/en/products. Accessed: 08/15/2013. Holmes-Higgin DK, Baker PC, Burris TE, et al. Characterization of the aspheric corneal surface with intrastromal corneal ring segments. J Refract Surg. 1999 Sep-Oct. 15(5):520-8. [Medline]. Burris TE, Holmes-Higgin DK, Silvestrini TA, et al. Corneal asphericity in eye bank eyes implanted with the intrastromal corneal ring. J Refract Surg. 1997 Sep-Oct. 13(6):556-67. [Medline]. Colin J, Velou S. Implantation of Intacs and a refractive intraocular lens to correct keratoconus. J Cataract Refract Surg. 2003 Apr. 29(4):832-4. [Medline]. Hellstedt T, Makela J, Uusitalo R, et al. Treating keratoconus with intacs corneal ring segments. J Refract Surg. 2005 May-Jun. 21(3):236-46. [Medline]. Donnenfeld ED. Intacs vs LASIK for Low Myopia. AAO Refractive Surgery Subspecialty Day Manual. 2000. Baikoff G, Maia N, Poulhalec D, et al. [Diurnal variations of refraction and keratometry after intracorneal rings]. J Fr Ophtalmol. 1999 Mar. 22(2):169-75. [Medline]. Barach D, Mortemousque B, Bertel F, et al. [Fluctuations in uncorrected visual acuity after refractive surgery using intra-stromal corneal rings]. J Fr Ophtalmol. 1999 Apr. 22(3):335-8. [Medline]. Nio YK, Jansonius NM, Wijdh RH, et al. Effect of methods of myopia correction on visual acuity, contrast sensitivity, and depth of focus. J Cataract Refract Surg. 2003 Nov. 29(11):2082-95. [Medline]. Twa MD, Hurst TJ, Walker JG, et al. Diurnal stability of refraction after implantation with intracorneal ring segments. J Cataract Refract Surg. 2000 Apr. 26(4):516-23. [Medline]. Burris TE. Intrastromal corneal ring technology: results and indications. Curr Opin Ophthalmol. 1998 Aug. 9(4):9-14. [Medline]. Tran DB, Zadok D, Carpenter M, et al. Intraocular pressure measurement in patients with intrastromal corneal ring segments. J Refract Surg. 1999 Jul-Aug. 15(4):441-3. [Medline]. Grabner G, Ruckhofer J, Tratter C, et al. [The intrastromal corneal ring (KeraVision Ring, ICR, ICRS). A modern method for correcting minor myopia]. Wien Med Wochenschr. 1997. 147(12-13):309-21. [Medline]. Assil KK, Barrett AM, Fouraker BD, et al. One-year results of the intrastromal corneal ring in nonfunctional human eyes. Intrastromal Corneal Ring Study Group. Arch Ophthalmol. 1995 Feb. 113(2):159-67. [Medline]. Schanzlin DJ, Asbell PA, Burris TE, et al. The intrastromal corneal ring segments. Phase II results for the correction of myopia. Ophthalmology. 1997 Jul. 104(7):1067-78. [Medline]. Twa MD, Karpecki PM, King BJ, et al. One-year results from the phase III investigation of the KeraVision Intacs. J Am Optom Assoc. 1999 Aug. 70(8):515-24. [Medline]. Loarie TM. The migration offshore of U.S. medical technology innovation--what it means for U.S. physicians. J Refract Surg. 1997 Mar-Apr. 13(2):176-84. [Medline]. Alió JL, Artola A, Hassanein A, et al. One or 2 Intacs segments for the correction of keratoconus. J Cataract Refract Surg. 2005 May. 31(5):943-53. [Medline]. Kessler D, El-Shiaty AF, Wachler BS. Evaluation of tear film following Intacs for myopia. J Refract Surg. 2002 Mar-Apr. 18(2):127-9. [Medline]. Fleming JF, Lovisolo CF. Intrastromal corneal ring segments in a patient with previous laser in situ keratomileusis. J Refract Surg. 2000 May-Jun. 16(3):365-7. [Medline]. Edelhauser HF. The resiliency of the corneal endothelium to refractive and intraocular surgery. Cornea. 2000 May. 19(3):263-73. [Medline]. Holmes-Higgin DK, Burris TE, Lapidus JA, et al. Risk factors for self-reported visual symptoms with Intacs inserts for myopia. Ophthalmology. 2002 Jan. 109(1):46-56. [Medline]. Azar RG, Holdbrook MJ, Lemp M, et al. Two-year corneal endothelial cell assessment following INTACS implantation. J Refract Surg. 2001 Sep-Oct. 17(5):542-8. [Medline]. Clinch TE, Lemp MA, Foulks GN, et al. Removal of INTACS for myopia. Ophthalmology. 2002 Aug. 109(8):1441-6. [Medline]. FDA. Intacs. Summary of safety and effectiveness. FDA. 1999. Bourcier T, Borderie V, Laroche L. Late bacterial keratitis after implantation of intrastromal corneal ring segments. J Cataract Refract Surg. 2003 Feb. 29(2):407-9. [Medline]. Hofling-Lima AL, Branco BC, Romano AC, et al. Corneal infections after implantation of intracorneal ring segments. Cornea. 2004 Aug. 23(6):547-9. [Medline]. Burris TE, Holmes-Higgin DK, Silvestrini TA. Lamellar intrastromal corneal tattoo for treating iris defects (artificial iris). Cornea. 1998 Mar. 17(2):169-73. [Medline]. Ruckhofer J, Twa MD, Schanzlin DJ. Clinical characteristics of lamellar channel deposits after implantation of intacs. J Cataract Refract Surg. 2000 Oct. 26(10):1473-9. [Medline]. Holmes-Higgin DK, Burris TE. Corneal surface topography and associated visual performance with INTACS for myopia: phase III clinical trial results. The INTACS Study Group. Ophthalmology. 2000 Nov. 107(11):2061-71. [Medline]. Asbell PA, Ucakhan OO. Long-term follow-up of Intacs from a single center. J Cataract Refract Surg. 2001 Sep. 27(9):1456-68. [Medline]. Levinger S, Pokroy R. Keratoconus managed with intacs: one-year results. Arch Ophthalmol. 2005 Oct. 123(10):1308-14. [Medline]. Nose W, Neves RA, Burris TE, et al. Intrastromal corneal ring: 12-month sighted myopic eyes. J Refract Surg. 1996 Jan-Feb. 12(1):20-8. [Medline]. Nosé W, Neves RA, Schanzlin DJ, et al. Intrastromal corneal ring--one-year results of first implants in humans: a preliminary nonfunctional eye study. Refract Corneal Surg. 1993 Nov-Dec. 9(6):452-8. [Medline]. Kymionis GD, Siganos CS, Kounis G, et al. Management of post-LASIK corneal ectasia with Intacs inserts: one-year results. Arch Ophthalmol. 2003 Mar. 121(3):322-6. [Medline]. Barbara A, Shehadeh-Masha'our R, Zvi F, et al. Management of pellucid marginal degeneration with intracorneal ring segments. J Refract Surg. 2005 May-Jun. 21(3):296-8. [Medline]. Mularoni A, Torreggiani A, di Biase A, et al. Conservative treatment of early and moderate pellucid marginal degeneration: a new refractive approach with intracorneal rings. Ophthalmology. 2005 Apr. 112(4):660-6. [Medline]. Rodriguez-Prats J, Galal A, Garcia-Lledo M, et al. Intracorneal rings for the correction of pellucid marginal degeneration. J Cataract Refract Surg. 2003 Jul. 29(7):1421-4. [Medline]. Burris TE, Baker PC, Ayer CT, et al. Flattening of central corneal curvature with intrastromal corneal rings of increasing thickness: an eye-bank eye study. J Cataract Refract Surg. 1993. 19 Suppl:182-7. [Medline]. Piñero DP, Alio JL. Intracorneal ring segments in ectatic corneal disease - a review. Clin Experiment Ophthalmol. 2010 Mar. 38(2):154-67. [Medline]. Durrie DS, Vande Garde TL. LASIK enhancements. Int Ophthalmol Clin. 2000 Summer. 40(3):103-10. [Medline]. Assil KK. Intacs as an Enhancement Procedure. AAO Refractive Surgery Subspecialty Day Manual. 2000. 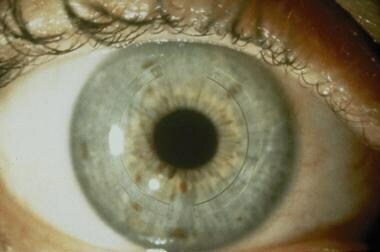 Mediphacos Keraring intrastromal corneal ring segments. Mediphacos. Available at http://www.mediphacos.com.br/en/produtos_implanteIntraEstromalKeraring.asp. Accessed: August 15, 2013. Daxer A. Biomechanics of Corneal Ring Implants. Cornea. 2015 Nov. 34 (11):1493-8. [Medline]. Elsaftawy HS, Ahmed MH, Saif MY, Mousa R. Sequential Intracorneal Ring Segment Implantation and Corneal Transepithelial Collagen Cross-Linking in Keratoconus. Cornea. 2015 Nov. 34 (11):1420-6. [Medline]. Ibares-Frías L, Gallego P, Cantalapiedra-Rodriguez R, Merayo-Lloves J, Martínez-García MC. Clinical, Refractive and Histological Reversibility of Corneal Additive Surgery in Deep Stroma in an Animal Model. Curr Eye Res. 2016 Feb 18. 1-10. [Medline]. Al-Tuwairqi WS, Osuagwu UL, Razzouk H, Ogbuehi KC. One-Year Clinical Outcomes of a Two-Step Surgical Management for Keratoconus-Topography-Guided Photorefractive Keratectomy/Cross-Linking After Intrastromal Corneal Ring Implantation. Eye Contact Lens. 2015 Nov. 41 (6):359-66. [Medline]. Hashemian MN, Zare MA, Mohammadpour M, Rahimi F, Fallah MR, Panah FK. Outcomes of Single Segment Implantation of Conventional Intacs versus Intacs SK for Keratoconus. J Ophthalmic Vis Res. 2014 Jul-Sep. 9 (3):305-9. [Medline]. Avni-Zauberman N, Rootman DS. Cross-linking and intracorneal ring segments--review of the literature. Eye Contact Lens. 2014 Nov. 40 (6):365-70. [Medline]. Alio JL, Vega-Estrada A, Esperanza S, Barraquer RI, Teus MA, Murta J. Intrastromal corneal ring segments: how successful is the surgical treatment of keratoconus?. Middle East Afr J Ophthalmol. 2014 Jan-Mar. 21 (1):3-9. [Medline]. The 1.2-mm radial incision is made with a diamond knife at the edge of a 7-mm optical zone. The diamond knife is set for approximately two thirds of corneal depth. Reprinted with permission of Addition Technology Inc.
Rotation of the dissector creates the tunnel in the peripheral cornea into which an Intacs insert will be placed. Reprinted with permission of Addition Technology Inc. The first Intacs insert is placed in the tunnel. Reprinted with permission of Addition Technology Inc.
An Intacs insert in place at approximately two thirds of corneal depth. Reprinted with permission of Addition Technology Inc.